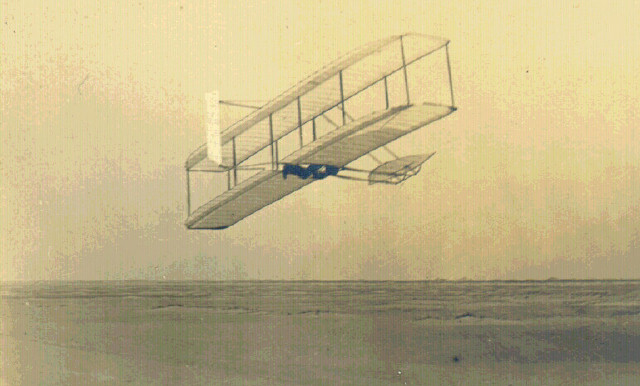 he brothers were back in Kitty Hawk by the end of August 1902. 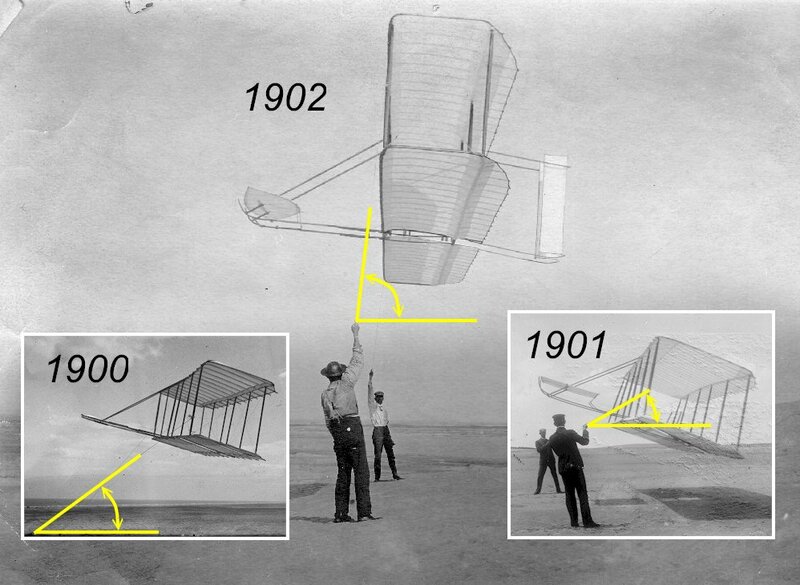 Their new glider was a biplane with roughly the same wing surface area as the 1901 machine, but the similarities ended there. 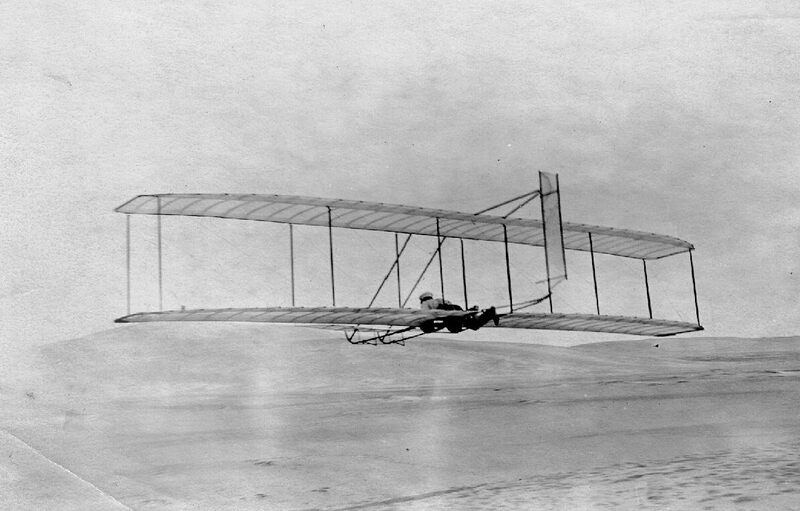 The wing span was ten feet longer and the chord two feet shorter than the older machine, making the glider look not just larger, but also more graceful. The wing camber followed a shallow parabolic curve, that of air foil No. 12 from their wind tunnel tests – this was the most efficient wing shape they had found, with the highest lift-to-drag ratio. The elevator was extended farther out in front of the pilot. This gave it more leverage, which translated into better control. Finally, the brothers decided to replace the tail they had abandoned in 1900. 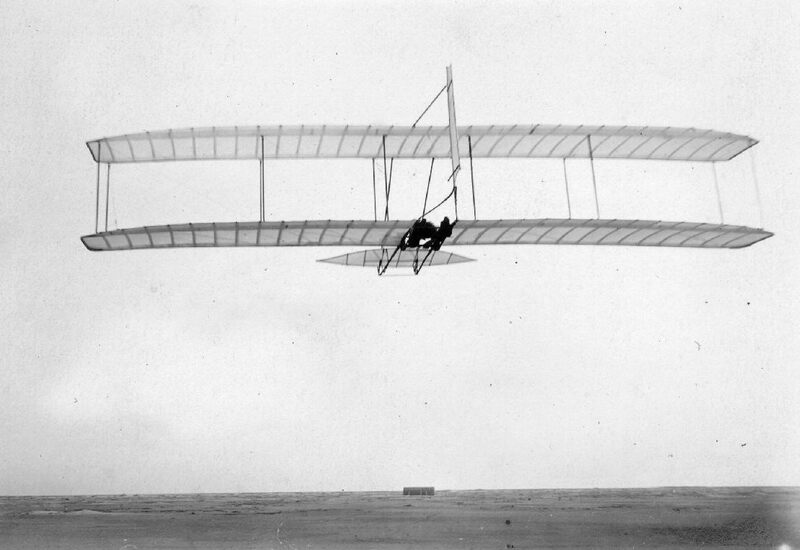 The 1902 glider had two fixed vertical surfaces behind the aircraft. 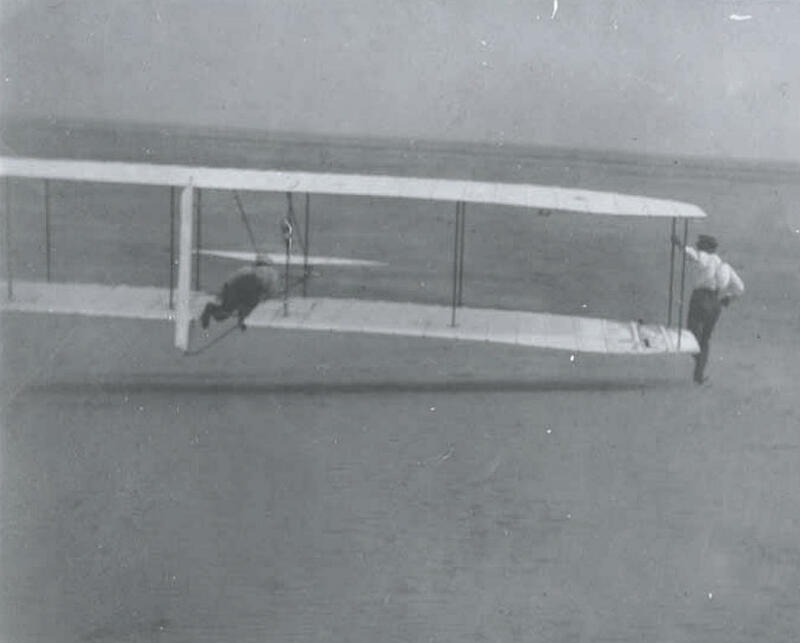 Wilbur and Orville calculated that these would help prevent the unwanted yawing and skidding that occurred when they warped the wings of their 1901 glider. with me in the center without a scratch or a bruise." 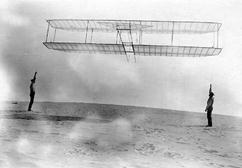 But it took more than a crash to discourage the brothers at this point -- they put the glider back together and kept on flying. 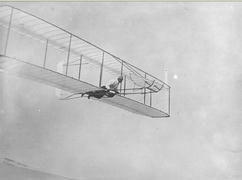 Will and Orv began to think about the possibility of "soaring" flight. 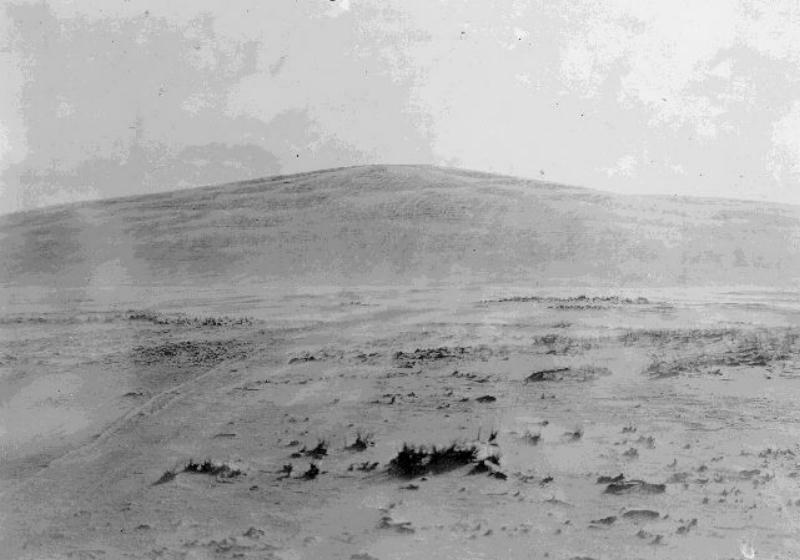 They knew that the wind blew upslope when it met a dune. They carefully observed birds who took advantage of these upslope winds, riding them to higher altitudes without flapping a wing. Gulls, osprey, and other native birds could soar for hours expending very little energy. They simply rode the air currents, finding a rising wind that would lift them up whenever they got too close to the ground. The brothers reasoned they could do the same provided two conditions. 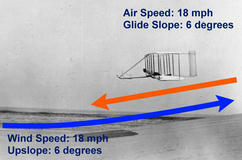 First, their angle of descent (now called a glide slope) had to be equal to or less than the slope of the rising wind. 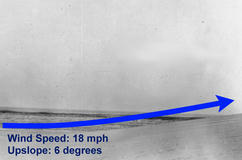 Second, the wind had to blow upslope at least as fast as the minimum speed at which the glider flew. 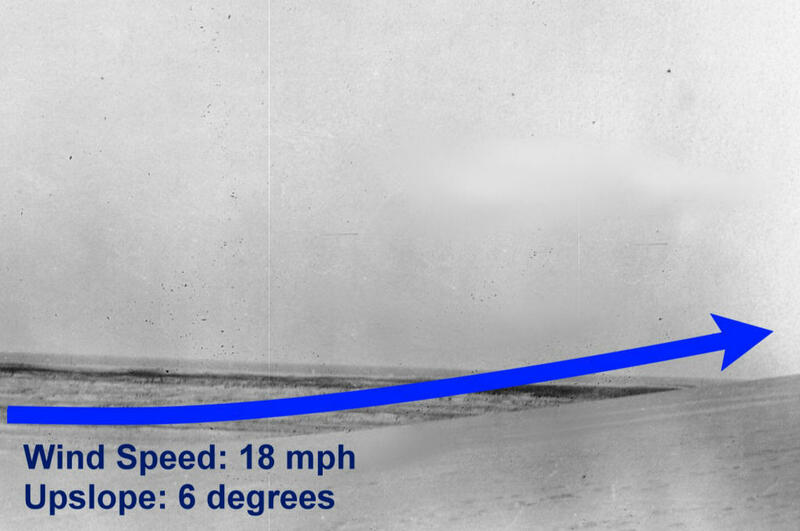 Theoretically, if their airspeed and glide slope matched the slope and speed of the rising wind, they could stay aloft indefinitely – the glider would appear to hover over the same spot without losing altitude. The first step was to keep the glider pointed into the wind as they flew. But they were thwarted in this simple task by a persistent problem. The glider still skidded when they warped the wings, yawing toward the wing tip with the highest angle of attack. 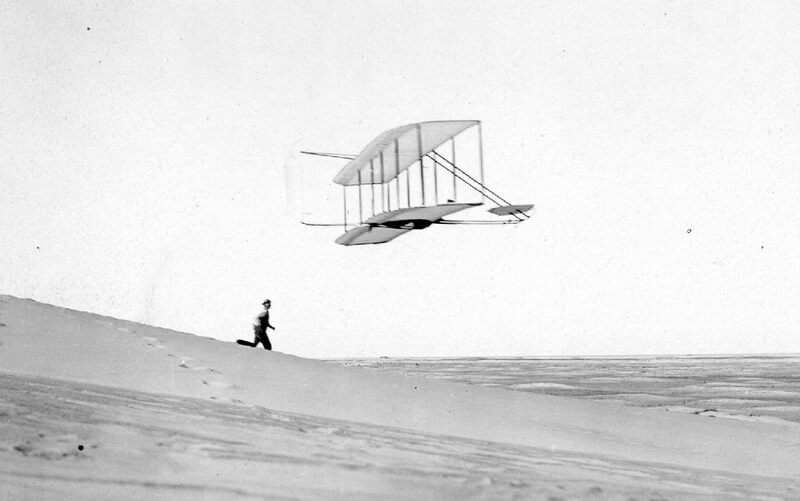 The tail did little to stop it; in fact, Orville suspected it actually aggravated the problem by presenting a broad surface to the airstream when the plane was skidding and causing it to yaw even more. In some instances, when the glider was traveling just above its stall speed (the speed at which it stopped flying), the airplane would quickly and unexpectedly roll and yaw toward the wing with the highest angle of attack and smash into the sand. This reminded the brothers of something they had done earlier. When they had arrived in Kitty Hawk in 1901, and then again in 1902, they had sunk a well by hammering lengths of pipe into the sand until the end of the pipe was below the water table. The way the glider hammered itself into the sand recollected this "well-digging." 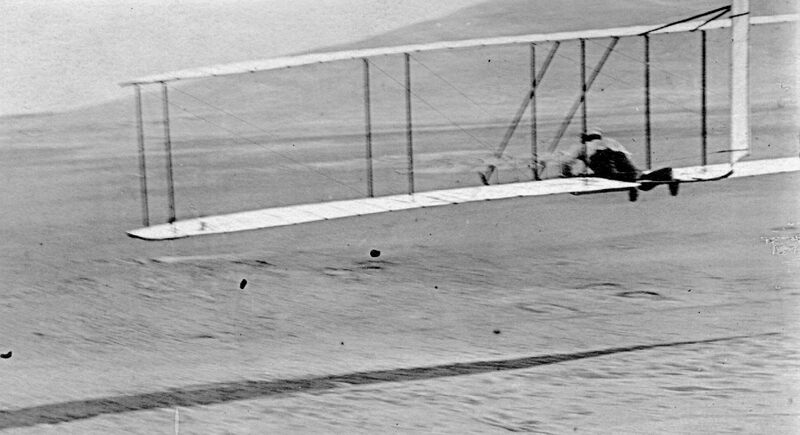 Thinking it through, Orville determined that the glider behaved this way because the portion of the wing with the highest angle of attack was also producing more drag than the rest of the wing. The drag slowed and stalled one end of the wing in the airstream while the other end kept flying. With one end stalled, the wing rolled, yawed and crashed, all because of the unequal drag. The brothers could avoid digging wells if the fixed tail was transformed into a movable rudder with its own separate control. This would allow the pilot to adjust its angle in the airstream whenever he needed to roll the aircraft. The rudder would counteract the unequal drag, prevent the unwanted yaw, and keep the entire wing flying straight ahead at the same airspeed from wingtip to wingtip. No skidding, no well-digging. 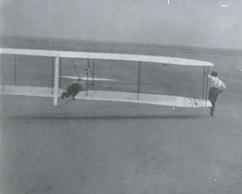 Wilbur accepted Orville's idea, but suggested the pilot already had enough to do without another control. Instead, the brothers coupled the wires that turned the rudder to the wing warping mechanism. This was the last piece of the control puzzle. 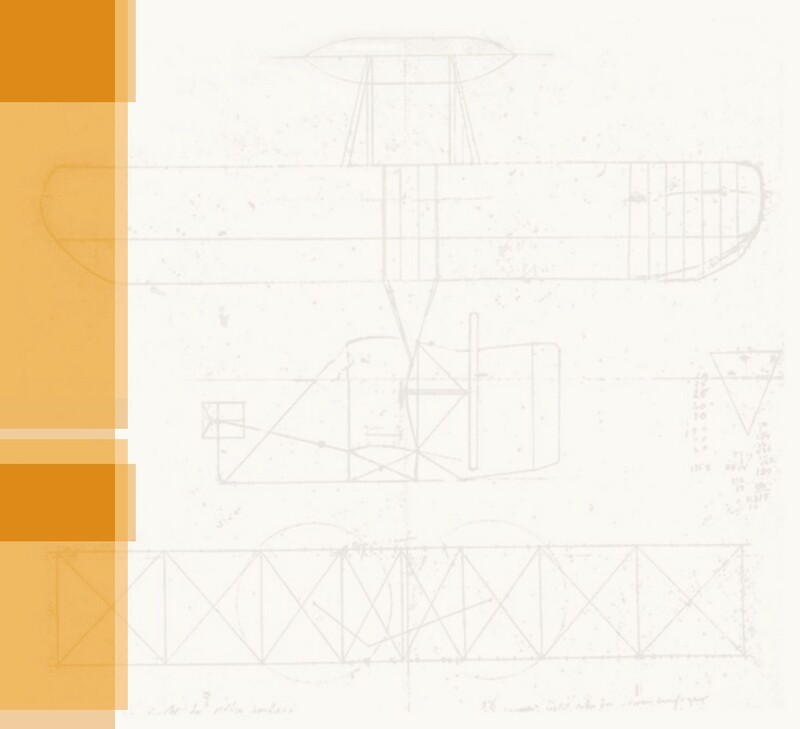 The movable rudder made the 1902 Wright glider the first aircraft capable of being precisely balanced in flight. The wing warping controlled roll, raising or lowering a wing. The elevator controlled pitch, turning the gliders nose up or down. And the rudder controlled yaw, moving the nose left or right. So basic was this breakthrough that every aircraft (and spacecraft!) flying today still uses the same fundamental roll, pitch, and yaw controls. 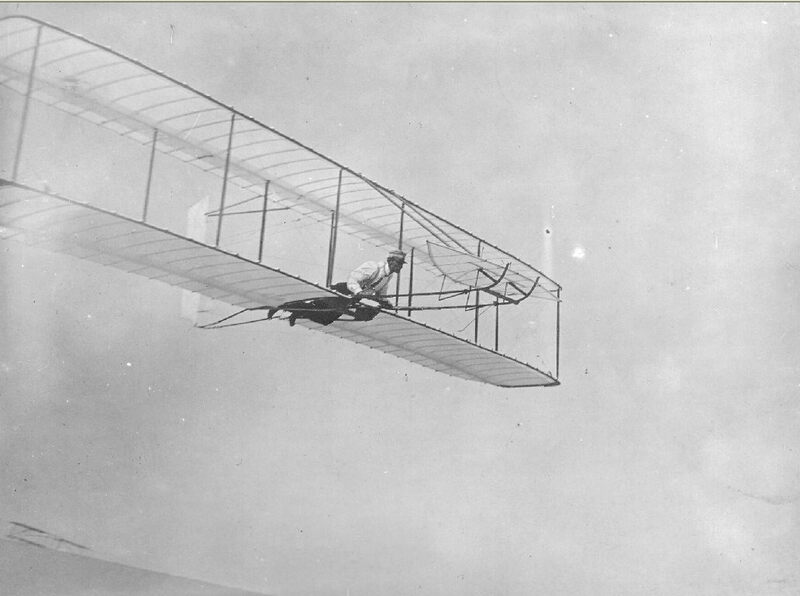 About the same time the Wrights added a rudder to their glider, guests began to arrive. The 1902 Kitty Hawk camp quickly became a crowded, busy place. The Wrights brother Lorin turned up unexpectedly, his curiosity having been aroused by their letters home. Octave Chanute and George Spratt visited again, along with another of Chanutes aeronautical acquaintances, Augustus Herring. 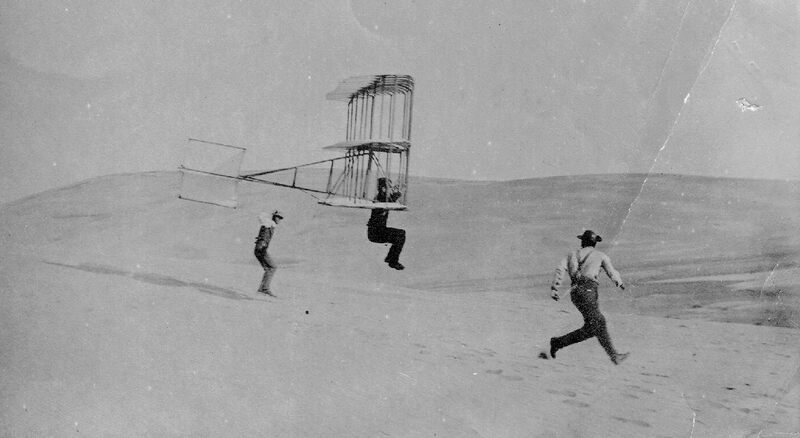 Herring was the co-designer and builder of the 1896 biplane glider that had inspired the Wrights own design. 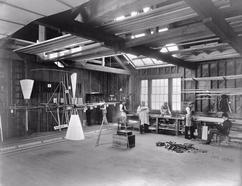 Chanute and company brought with them a folding tri-plane glider designed by Chanute and built by Charles H. Lamson, a maker of man-carrying kites residing in Long Beach, California. 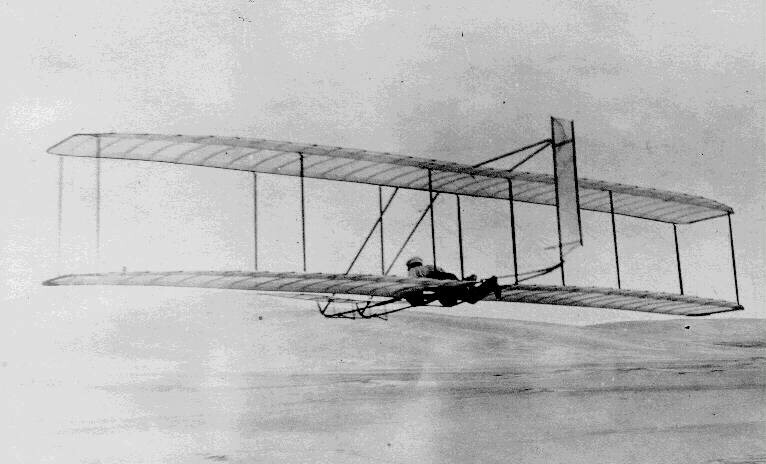 Chanute had offered the glider to the Wright brothers in exchange for testing it, but they had declined, claiming they had their hands full with their own experiments. So Chanute had brought Herring to be the test pilot. The Lamson glider was a humiliating failure, barely able to glide 50 feet (15 meters). 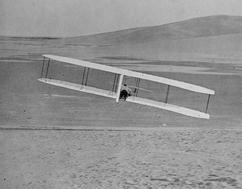 The Wrights were consistently flying between 300 and 400 feet (90 and 120 meters). The Lamson glider was tested for only a day, then abandoned. Herring left shortly thereafter, understandably jealous of the Wrights success. The remaining visitors helped the brothers launch their craft again and again, sometimes making over 75 flights in one day. Chanute also brought with him interesting news of Samuel Langley. 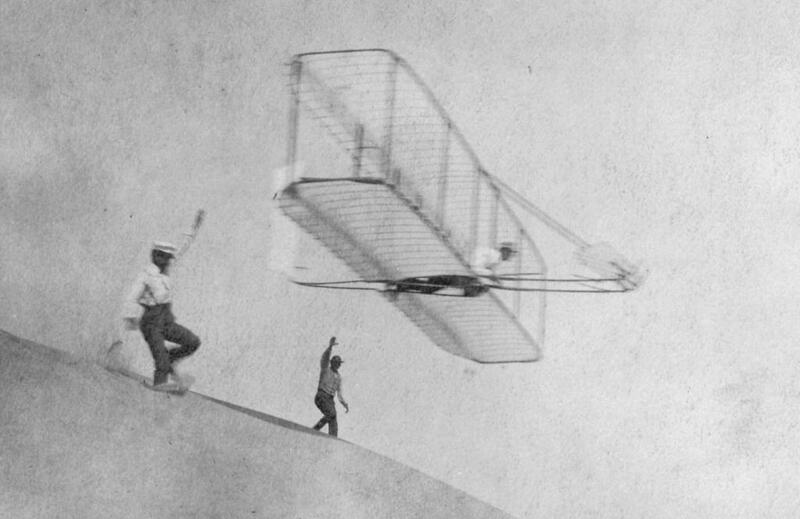 The U.S. Army, who was financing the research and development of the Great Aerodrome, was growing tired of Langley's delays – they had initially expected him to fly in 1901. The Army gave him until 1903 to demonstrate the Aerodome or they would withdraw their support of Langley and his team at the Smithsonian. The best flying came in late October, when their visitors left. Wilbur made a glide covering 622 feet; Orvilles best was 615 feet. But they also considered what Chanute had told them about Langley. Will and Orv had grown tremendously as both engineers and pilots in just a year's time. 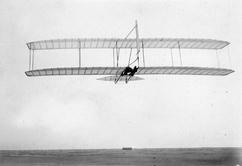 They had gained considerable knowledge and experience in designing and building airplanes and well as unique skills in flying them. Three years ago, the brothers would never have thought they might beat the great Dr. Langley into the air, but now...there was a possibility. 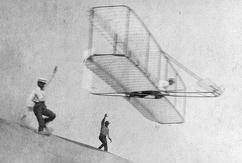 On 24 October 1902, the Wright brothers conducted their first experiment directly related to powered flight. When they had warped their gliders' wings before, the wings twisted all along their span. 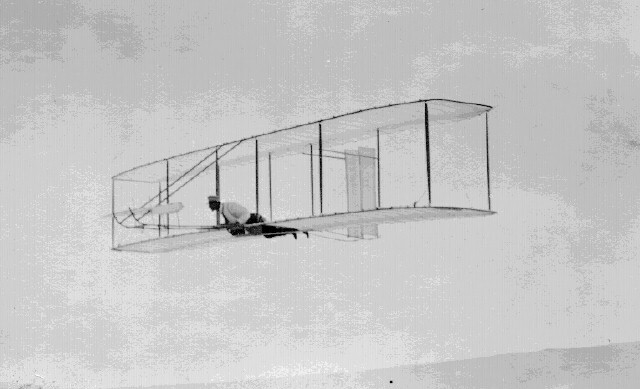 But in this experiment, Will and Orv rigged the control system so just the wingtips twisted – the center section of the glider remained rigid as it would have to do if there was an engine and drive train mounted in the aircraft. 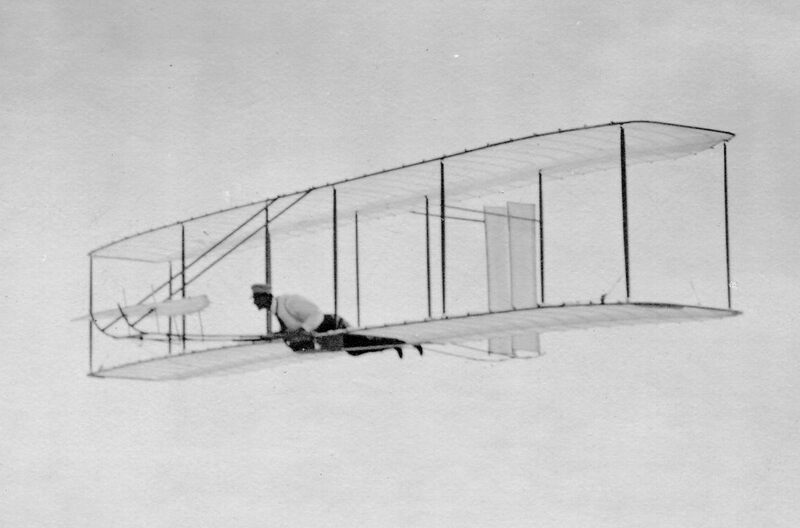 The Wrights wanted to see if they could effectively roll the glider with just the wingtips. And they could. Will and Orv packed up and left for Dayton. 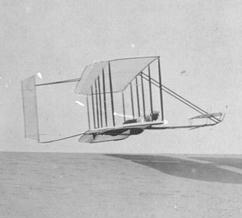 The soaring adventure was set aside as the Wrights re-focused their efforts on being the first to successfully fly a powered aircraft. The race was on. 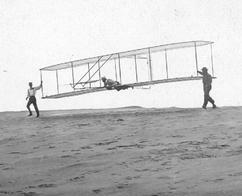 Arriving at Kitty Hawk on 27 August 1902 -- quarters were initially crowded by the 1901 glider until it was dismantled. 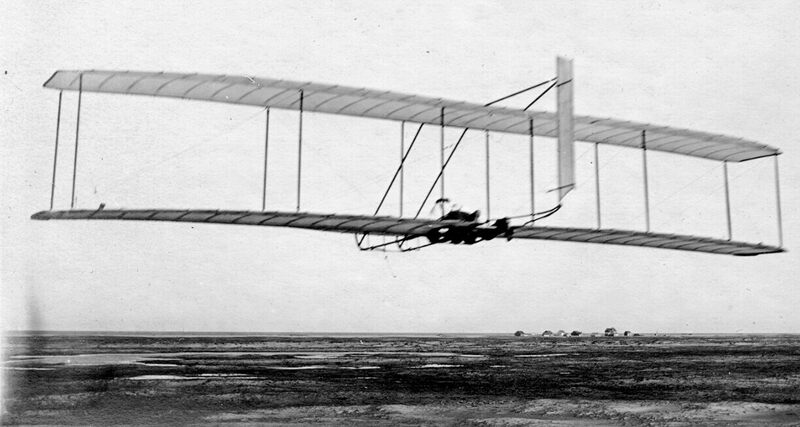 The struts and other parts were recycled in the 1902 glider. 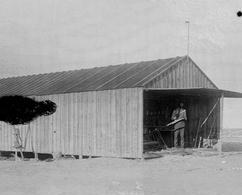 The Wright camp was at the base of Kill Devil Hills, south of Kitty Hawk. This is the view of the Big Hill from the camp. 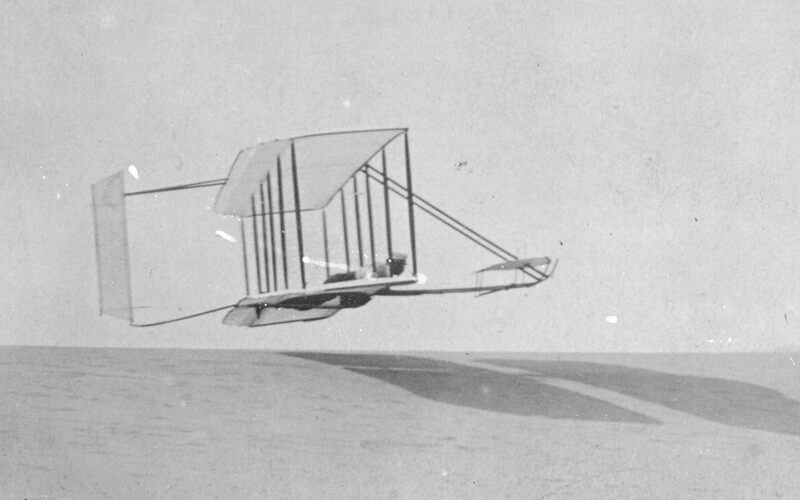 As in 1900 and 1901, on of the Wrights' first experiments with their 1902 glider was to fly it as a kite to measure the lift and drag it produced. 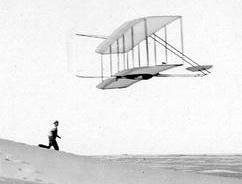 The Wright brothers were hoping to soar in a rising wind. Where the wind met the base of the dunes, it followed the dune contour upslope. 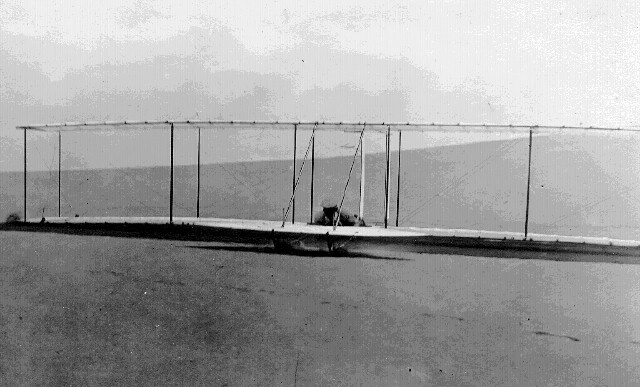 For the first time, the Wright brothers added a tail to their glider -- two flat, fixed panels. These were intended to keep the glider pointed forward and prevent the nose from hunting or "yawing" off course. It did not work. 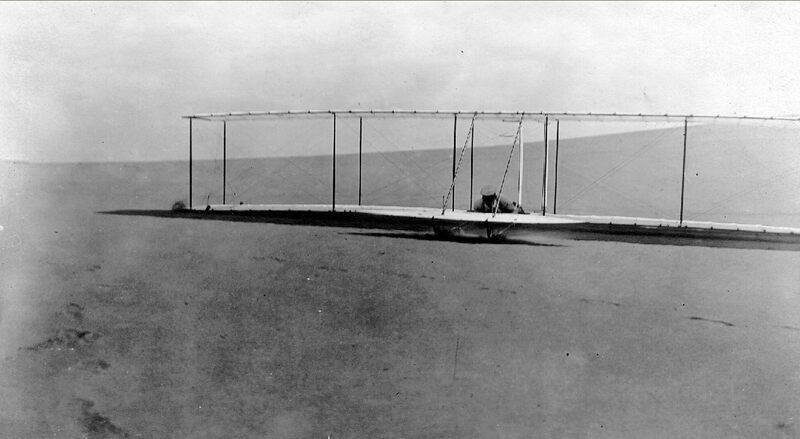 To counteract this "adverse yaw," the Wrights converted the fixed tail into a movable rudder. The rudder turned in the direction of the wing producing the least lift, creating an aerodynamic force that balanced the excess drag from the other wing. Guests began arriving 1 October 1902. From left to right, this photo shows Octave Chanute, Orville, Wilbur, Augustus Herring, George Spratt, and Dan Tate (a local "banker" the Wright hired to help with launches and other chores). The Wrights' older brother Lorin also came for a visit – he snapped this photo. 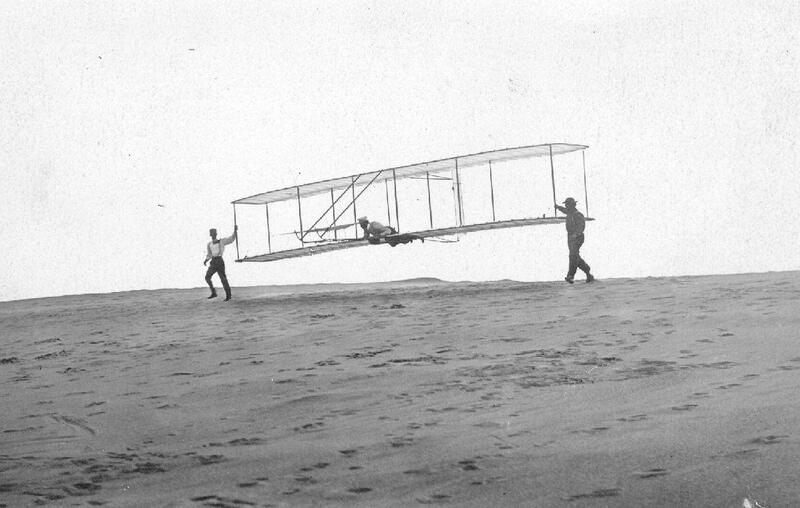 To launch the 1902 Wright glider, the first order of business was to carry it up a sand dune. This was less work than it looks to be. The crew turned the glider to face the wind and let it fly uphill. If the wind was sufficiently strong, the glider dragged the crew along. When the pilot was ready, the crew ran the glider forward into the wind. The pilot adjusted the forward elevator, searching for the neutral position where the nose was neither rising or falling. 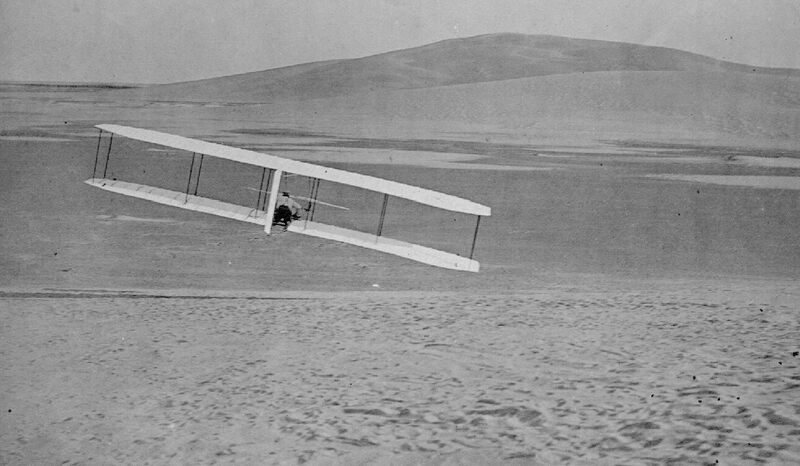 When the pilot was certain he had sufficient airspeed to maintain flight, he sailed out from the dune and increased altitude, but usually no more than 10 to 15 feet (3 to 4.5 meters) above the ground. Here Wilbur flies out from a dune. 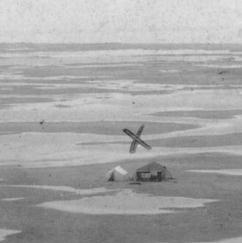 The abandoned Lamson glider can be seen resting on the sand in the bottom left hand corner of the photo. On this flight, the pilot traveled west – the wind was blowing from west to east. 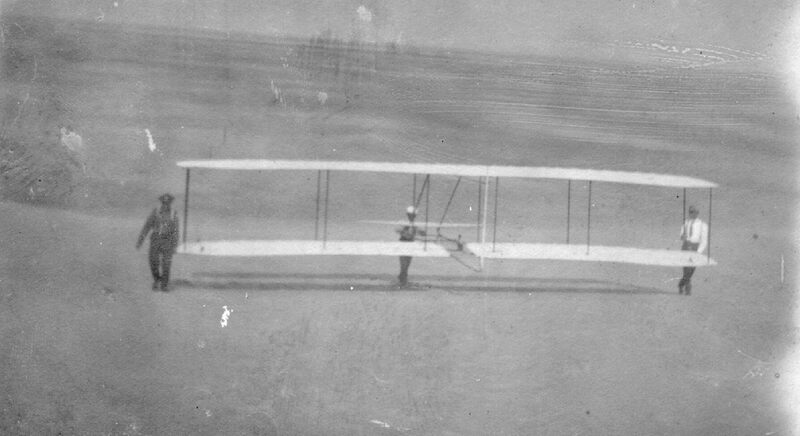 You can see the buildings of Kitty Hawk off the pilot's right wing. Upon at the base of the dune, the pilot raised the nose to level out and tried to "stretch" his flight as long as possible. 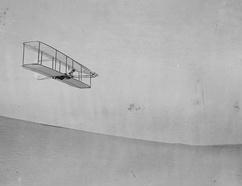 Once he got within a few inches of the ground, however, the pilot intentionally stalled the glider to land it. He raised the nose gently until he felt the machine begin to slow. Samuel Langley built the Great Aerodrome in the Smithsonian Aeronautical Laboratory. 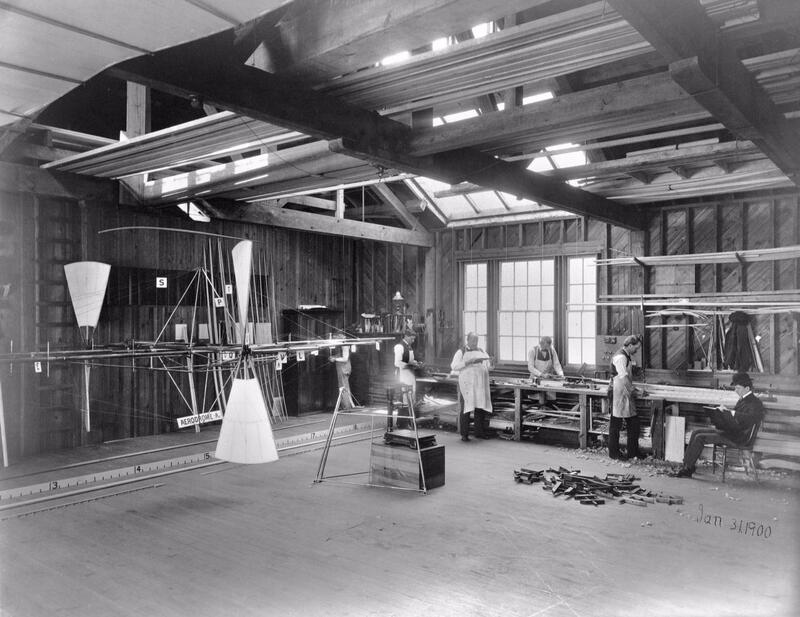 This modest workshop with its small team of craftsmen, engineers, and scientists would later evolve to become NACA and finally NASA. 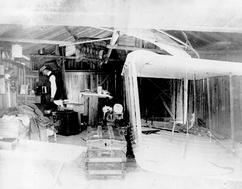 The hangar was in bad shape; storms had washed away the sand at one end so it drooped almost two feet. 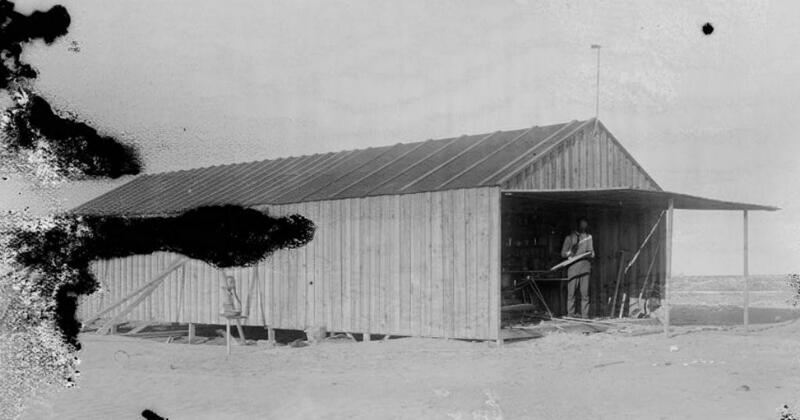 But the Wrights shored it up and enlarged the building to accommodate the new, larger glider. They also sank a new well -- note the pump. And this is the view of the camp from the top of the Big Hill. The tent provided extra living quarters for the guests that visited the Wrights during the 1902 flying season. 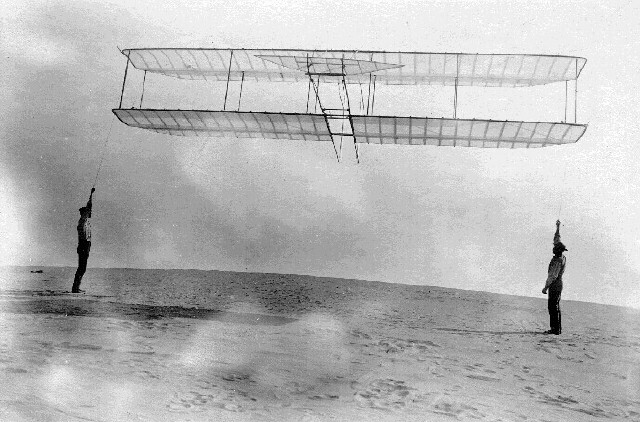 The Wrights calculated the lift-to-drag ratio of a glider design by measuring the angle of the tether ropes to the horizon. The larger the angle, the higher the lift in proportion to the drag. 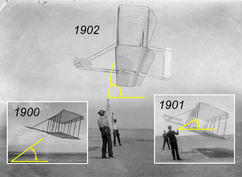 Note the huge angle at which the 1902 glider kited in relationship to the 1900 and 1901 gliders. Theoretically, if the glider flew at the same speed as the wind and descended at the same rate that the wind rose, it could stay aloft indefinitely flying above the same spot in the sand. This was soaring. When the glider rolled to one side, the pilot warped the wings to increase the lift on the low side and bring the wing up. But this also increased the drag on the low side and cause the glider to yaw in the direction of the wing that was producing the most lift. Here the glider has dropped its right wing and Orville is warping the wings to increase lift on the right side, trying to bring the wings back to level. But he is also producing more drag on the right. The rudder is angled toward the left, creating a force to oppose the drag and keep the glider pointed straight ahead. 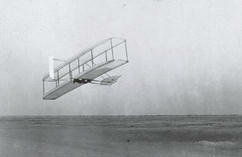 Chanute had designed a triplane glider with "oscillating wigs" and had it built by Charles H. Lamson. He offered it to the Wrights if they would test it for him. They declined, and so Augustus Herring made a few glides. 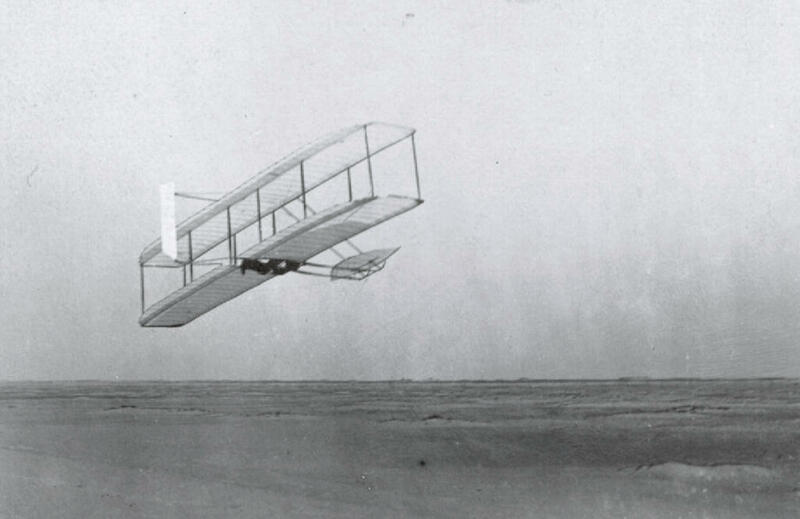 Its performance was poor when compared to the Wright glider. 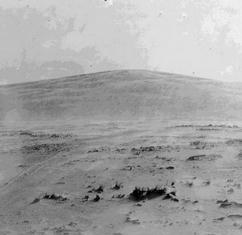 At the top of the dune, the pilot lay down in the cockpit and two crew – one on either side -- picked the glider up. At this point the glider was already flying in the wind; the crew simply guided it during the launch. Upon reaching the crest of the dune, where the ground sloped steeply down, the launch crew released the glider. The pilot angled the elevator down slightly to lower the nose and increase airspeed. The direction of flight depended on the wind. 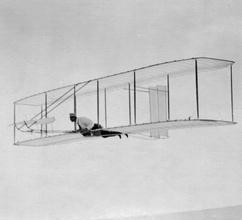 The Wrights rarely turned in the air; their goal was to keep the glider pointed into the wind and the air flowing over the wings. 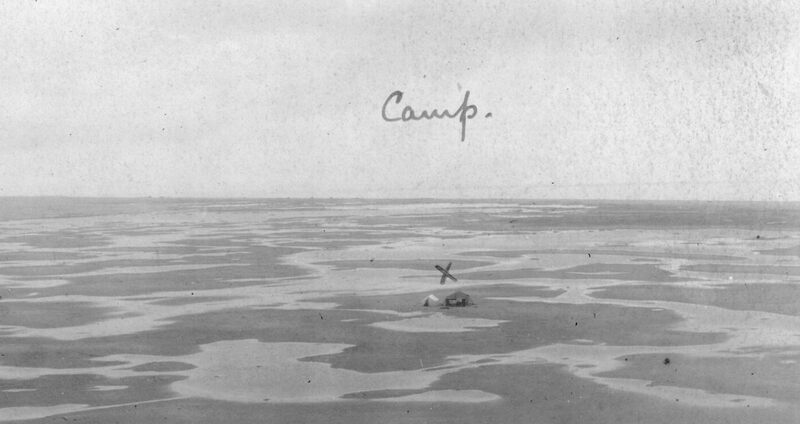 Here Wilbur is flying north – you can see the camp in the distance. 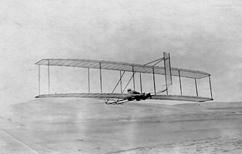 The glider cruised at 18 to 20 miles per hour (29 to 32 kph) airspeed. 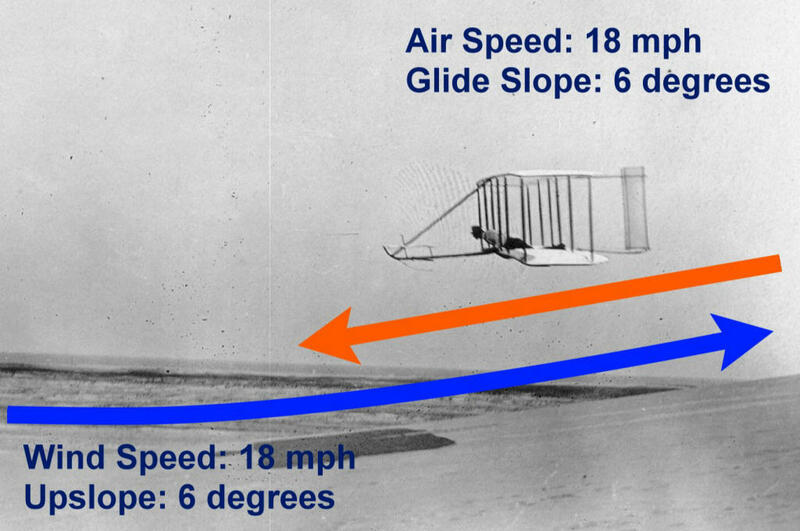 Often the wind was blowing 15 mph (24 kph) or better, so the groundspeed of the aircraft was only a few miles (or kilometers) per hour. 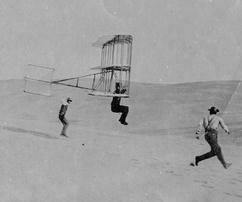 Here Dan Tate trots along under the glider as Wilbur flies. This was a tricky maneuver. If the pilot raised the nose too high in an attempt to stretch the flight, the airspeed would bleed off, the glider would "stall" (lose all lift) and drop to the ground. Holding the nose in this attitude, the pilot let his airspeed decrease until the glider lost all lift and dropped into the sand, skidding forward a short distance. The Last Piece of the Puzzle traces Orville's thoughts as he lay awake on the evening of 3 October 1902 and mentally worked his way through the problems of adverse yaw and well-digging.